saxophone equivalent of a string quartet. addition and asset to dozens of functions." The Toronto Saxophone Quartet began in an unusual way. My cousin was a Bassoon player in the Toronto Symphony Orchestra and had bought a soprano saxophone (a rare instrument at the time) and eventually sold it to me. Unfortunately there weren’t many occasions for using this instrument. 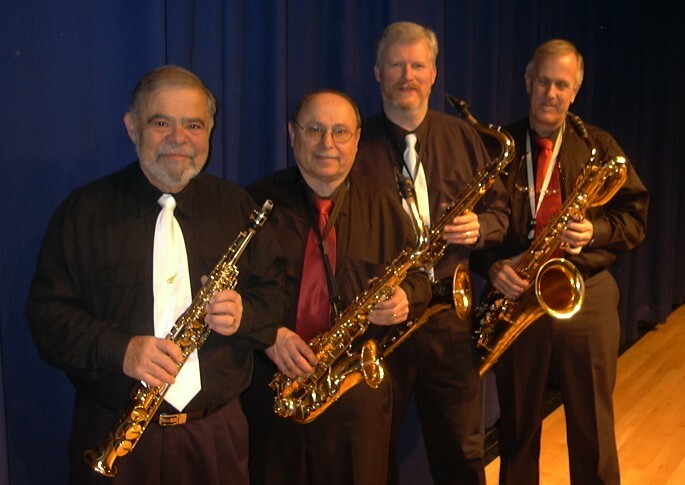 At that time I was playing lead alto saxophone with an 18-piece big band and one of the players in my sax section brought some sax quartet arrangements he had written, based on string quartets by Mozart and Haydn. We tried them during intermission and I was immediately hooked by the magic of the saxophone quartet. I realized that, if I wanted to play my new toy, it would have to be in a sax quartet. And so began the TSQ, with six or seven arrangements. As time went by, I acquired more pieces, buying or trading with other sax quartets. This process has continued right up to the present and I now have a library of over 1,500 pieces. This huge resource gives unparalleled versatility and flexibility and can provide audiences with music appropriate to the occasion. The TSQ as it is presently constituted is the best version yet. Each of the members is a fine player and thoroughly enjoys being in the quartet. The result is a finely-tuned ensemble playing at a high professional level. In its present form the TSQ has been around for at least ten years. Adding the years of playing experience of each of the members of the TSQ gives us a total of around 200 years of musicianship. Our music, however, remains fresh and exciting.